Ideable’s exhibition stand the AAL Forum 2018 will be jam-packed with VR games, tablets and serious games in order to not only entice you but to show you the excellent developments they have made as a software SME focused on elderly care and eHealth. As one of the 20 European winners of the FICHe eHealth accelerator’s, Ideable will be displaying Kwido, a multi-device platform for caring for elderly people they have built, as well as Zocaalo, the European marketplace that certifies apps for elderly users. Ideable are already launching telemedicine services for controlling blood pressures and many other variables, at home; have a cognitive simulation platform based in serious games for detecting and combating cognitive impairment, which includes VR games; and are currently working in different AAL projects involved in tracking activity, access to business and services adapted to elderly users. 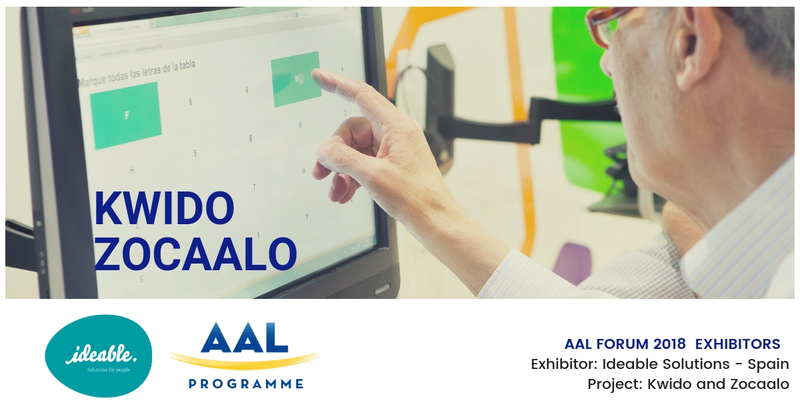 Not only can you catch Ideable during the two days of the exhibition, you will also be able to be a part of Workshop 10 – Growing the AAL market: ensuring effective deployment of real-life solutions during AAL, which Iñaki Bartolome, CEO of Ideabale will be participating in.